The purpose of the study was to determine the biomechanical status of the different components of the Latarjet procedure. 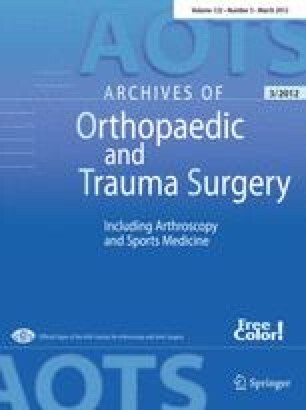 The anterior capsule reconstruction with the transferred coracoacromial ligament (CAL) and the necessity of an intact subscapularis tendon were of particular interest. We hypothesized that the anterior capsule reconstruction will have a significant effect and that the Latarjet procedure will lose its stabilizing effect if the subscapularis tendon is torn. Stability testing of 12 human shoulder specimens was performed. After testing of the intact joint, a combined anterior glenoid and capsule defect was set arthroscopically. Then the Latarjet procedure was performed using an open approach and tested with and without loading of the conjoint tendons (10 N). Afterwards, the specimens were distributed into two groups and the Latarjet technique was reduced stepwise: dissection of the CAL, dissection of the conjoint tendons (group A); reduction of the coracoid segment, dissection of the subscapularis tendon (group B). Biomechanical testing was performed for each condition in two positions: 60° of glenohumeral abduction with neutral rotation and with 60° of external rotation; each with a passive humerus load of 30 N in the anterior, inferior and anteroinferior direction. The Latarjet technique with load applied to the conjoint tendons significantly reduced translation compared with the defect condition for all tested positions in all directions. In group A, the CAL-dissection led to a significant increase of anterior translation (+5.0 mm, p = 0.003) and inferior translation (+7.3 mm, p = 0.025) in neutral rotation and of anterior translation in 60° of external rotation (+4.4 mm, p = 0.034). In group B, the reduction of the coracoid bone down to the coracoid tip resulted in a significant increase of only the anterior translation in abduction and 60° of external rotation (+4.5 mm, p = 0.05). In contrast, the detachment of the subscapularis tendon led to a significant increase of translation in all testing positions except the inferior direction in the neutral rotation. We found the anterior capsule reconstruction to represent a significant contribution to the stabilizing effect of the Latarjet procedure, whereas a deficiency of the subscapularis tendon eliminates its effect. We recommend to perform the Latarjet technique with an anterior capsule reconstruction (e.g. CAL transfer) and with a transfer of the coracoid bone block rather than a transposition of the coracoid tip. Furthermore, we were able to show that an intact subscapularis tendon is a necessary prerequisite for a reliable stabilization. Winner of the AGA-Medi-award 2011.